Much of Glebe was laid out at a time when most people still travelled quite long distances on foot. The better off might have carriages or horses, but for the majority this was an unobtainable luxury, so there was no problem with building homes that had pedestrian access only. Public transport, such as steam trams, ran on the major routes from the 1870s, if you could afford it. Named after Lord Palmerston (1784-1865), British Foreign Secretary and Prime Minister, a Liberal and supporter of national self-determination: ‘the real policy of England is to be the champion of justice and right’. He was also responsible for the Factory Acts limiting the labour of children, the Vaccination Act which made vaccination of children compulsory, and the ending of transportation to Tasmania. This Avenue introduces a further peculiarity of Glebe: the houses fronting this street are accessible only on foot, because it is not at this point trafficable. The upper, trafficable section finishes at the intersection with Lombard Street. Houses accessible only by foot are also along the lane on the opposite side of Palmerston Avenue, Marlborough Lane, which actually front onto a footpath on top of a cliff, which we shall see shortly. Marlborough Lane is not only the sole vehicular access for these houses: it was also once the principal access for the drays and lorries belonging to Meloys. It is not difficult to imagine their joy when the carter sold the site! 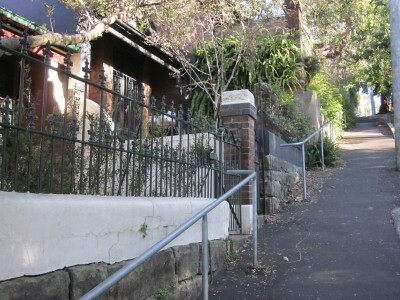 While Palmerston Avenue is steep, there are other made roads in Glebe that have a similar slope. It is likely the construction of the railway ensured it was closed to vehicles. The Avenue has, since 2000, become the main pedestrian access to Glebe Light Rail stop from Glebe Point Road. Proceed down the footpath and steps to the next stop, beside the light rail station.